The county once had about 120 school districts; apparently a handful of districts at the south end of the county were subject to boundary changes with the county below so the count was not always the same. The Nemaha County Historical Society has a map showing the school district boundaries in 1927, which is at the bottom of this page. They also have photographs of some of the schools. 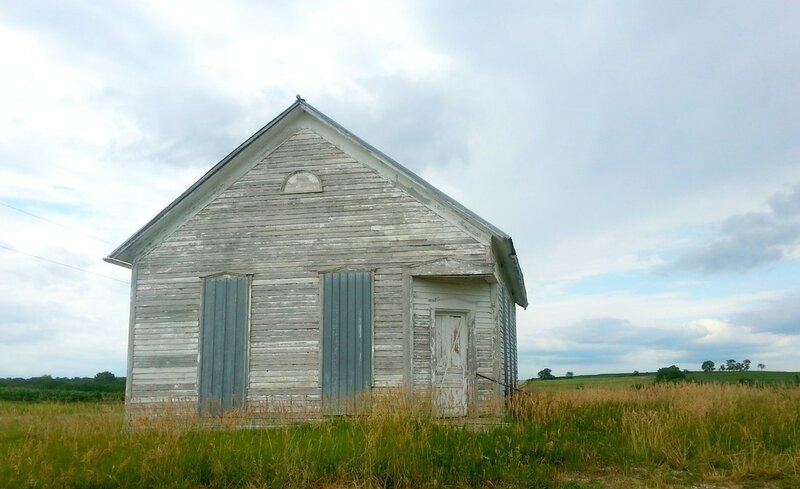 However, as with many historical societies, volunteer time is dear and and inventory of the surviving country schools has not made it past triage. On a July 4, 2017 visit to the Nemaha County Historical Society, the volunteers were friendly and kind. Archivist DarlAnn Rial made copies of the map and searched her records for clues as to which few of over 100 country schools actually survived. There was no time for a comprehensive search, but it appeared that Morning Star, Woodlawn, and the stone school at Albany remain in various states. Wetmore school has been re-purposed as a community center. The school in District 24 is gone. Ray Thieme spoke of his school days at the Pepperbox Country School and confirmed that it is gone, too. Marlene Geiser spoke fondly of Humphrey School, but it, too, is gone. Prairie Grove is on Township Road H, a short ways south of Road 232. It is on private land but readily accessible from the road. It is on the National Register of Historic Places for its value not only in the role of education but also because of its architecture, in particular its mansard bell tower. It was built in 1886 and forced by consolidation to close. It is about 15 miles south of Pawnee City, Nebraska. Much more information is contained in the National Register application. This school is on the "Baileyville Road" north of Baileyville. It is on 216th Road adjacent to Township Road E. One way to get there is to take 232 Road westbound from Highway 8 and go to the next black top. Turn left and you will come at the school from behind. Seen from behind, approaching on E Road from the north. Morning Star is southeast of Seneca. One way to get there is to take Highway 36 from Seneca, heading east. Turn right (south) on "W Road." It is a paved road. Follow it for quite a few miles. You will come to a large sign on the right referring to the "Shoe Tree" and that is a nice detour --only one mile to see a fun oddity that country school kids would have enjoyed. Back to W Road, continue south a couple three miles to 64th Road. Turn right on 64th Road and continue to V Road. You will come up on the school from its south side; the front of the school faces west. The names of the school districts are on a tag at the bottom. The districts appear to have been numbered as they were created, rather than in any geographical order. The name tag has been retouched for clarity to the extent permitted by the pixels.